One look at Bodum Columbia alone is enough to urge people to place buy. But there’s a lot more to it than mere looks. Our review covers them all - scroll down and discover whether it actually is worthy of your money. The main reason for recommending Bodum Columbia, obviously, is its performance. It brews strikingly good coffee, at a relatively less amount of time - making the entire process less painful for those used to Drip Coffee Makers. It comes equipped with a silicone and mesh plunger with a 3-part filter. This filter does an excellent job at filtering most of the grounds out of your coffee. But make sure they are coarse, because finer grounds will escape the filter. Once the coffee is brewed, you don’t have to rush to pour your cup. Sit back, relax, and wait for your TV show to start - Bodum Columbia will keep the coffee hot for you! The manufacturers have advertised it to hold coffee hot for about two hours - and the pot had stayed true to its words. However, as always, we’d recommend you have coffee sooner than later to prevent it from turning bitter. The unique shape of Bodum Columbia is surely worth stealing a glance at. Instead of the typical cylindrical shape, it has sophisticated curves that only serve to heighten its beauty. Two layers of stainless steel have been used to mould it into perfection. The outer layer has a spotless shine to it, which will conceal scratches and look brand new throughout its life. You’ll love just how easy this thing is to clean! When compared to other French Presses, the design results in fewer parts to clean. They all come off with a simple tug - which you won’t believe is possible given how snugly the parts fit. The best part, however, is that the entire French Press is dishwasher safe. Since there’s no glass carafe to watch out for, you can simply load the dishwasher and get ready for the next round! Being dishwasher-safe doesn’t mean it’s difficult to wash by hand. Dump the coffee ground, soap the filters and hold them under running water. The end. Not all parts of Bodum Columbia are made up of steel. This however, doesn’t mean that it’s fragile. The parts made up of plastic, such as the collar on the lid, are actually the parts that are not very significant. You need not to worry overly much about that. Instead focus on the longevity of this machine, which could end up being the last French Press you’ll ever buy. It feels solid right out of the box. The handle has a nice grip to it, and the entire metal body is made to resist corrosion well. 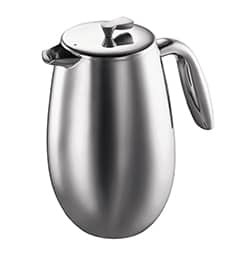 Stainless steel French Presses have always been on the expensive side. If they cost low, then they’re definitely of questionable quality. Bodum Columbia is an exception. It’s neither too expensive, nor cheap - making it a relatively affordable option for anyone on the market for a stainless steel model. It’ll also blend in well with beautiful home décor - winning hearts of both coffee and non-coffee drinkers alike. If you’re an absent-minded or careless coffee snob, then we’d hesitate a bit to recommend Bodum Columbia for you. The reason lies underneath the beautiful design of this French Press. In fact, the base of it feels a bit small next to the flared body. Though it stands solidly on a flat surface, it can be an easy target to tip. Bodum Columbia is an attractive and feminine French Press great at many things. The brew quality, to begin with, is top notch, and is built to last way past your money’s worth. We haven’t come across a French Press this easy to clean as well - making it definitely worth a buy.